Collocation means a natural combination of words; it refers to the way English words are closely associated with each other. For example, pay and attention go together, as do commit and crime, blond goes with hair and heavy with rain. You need to learn collocations because they will help you to speak and write English in a more natural and accurate way. People will probably understand what you mean if you talk about making a crime or say there was very hard rain this morning, but your language will sound unnatural and might perhaps confuse. Did you mean that there was a lot of rain or perhaps that there was a hailstorm? Moreover, learning collocations will aso help you to increase your range of English vocabulary. For example, you’ll find it easier to avoid words like very or nice or beautiful or get by choosing a word that fits the context better and has a more precise meaning. This is particularly useful if you are taking a written exam in English and want to make a good impression on the examiners. The two book both has 60 two-page units. The left-hand page presents the collocations that are focused on the unit. You will usually find examples collocations in typical contexts with, there appropriate, any special notes about their meaning and usage. The right-hand page checks that you have understood the information on the left-hand page by giving you a series of exercises that practice the material just presented. The units are organized into different sections. First the book starts with important information relating to learning about collocations in general. Then there is a section focusing on different types of collocation. 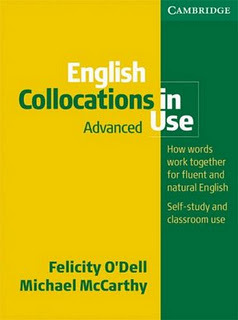 The rest of the book deals with collocations that relate to particular topics, concepts or functions. these links don’t work (for me, at least). Will you check out what’s wrong?